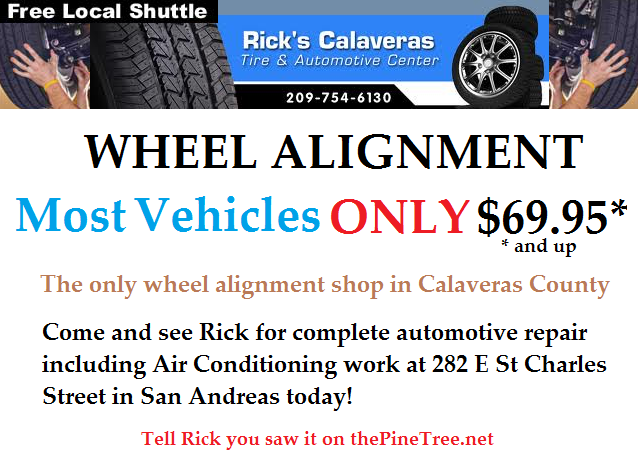 San Andreas, CA... Come see Rick for all your tire and automotive repair needs - even air conditioning! Autosmith In Hathaway Pines Will Have You Rolling In Style! Frontier Auto Supply Grand Opening Tomorrow!! 49er Motors Car Of The Week is a Super Clean 2003 VW Passat! Welcome "The Paint and Body Shop" in Angels Camp! Thanks H20-TO-GO for Advertising With Us! They Can Save You $$$ on Gas!! Cedar Center Was Filled with All Kinds of Machines on Saturday! If you need Tires, Fuel, Propane & More. Visit Nash Services Today. Nash Services Tires, Fuels, Service & More.